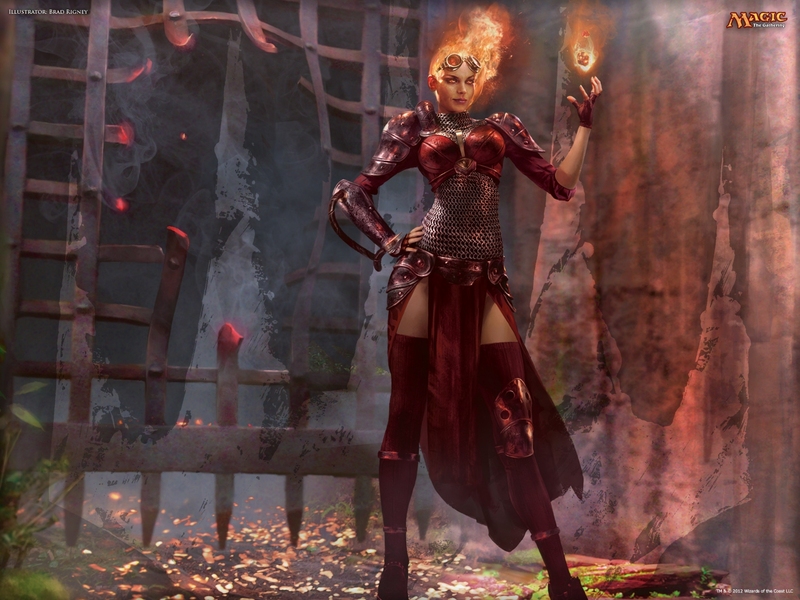 Chandra, the Firebrand is a planeswalker in an interesting place. Her power is entirely dependent on the context in which she is played. She can really shine in a format where there are powerful 1/1 or 2/1s. She needs to be in a deck with powerful spells that are worth copying. This puts her in a great place in certain Commander decks and Cubes. I feel that the $3 range is certainly too low for any planeswalker including Tibalt. I do not know of any other reason why she is seeing an increase at this time. Any time you can get a card for the same or better than buylist is a chance to get stock and an exit strategy with minimal risk. One day someone is going to run a Modern deck that runs Trickbind and Shadow of Doubt just to mess with people trying to use Birthing Pod or fetchlands. It will lose but it would be a great way to troll the metagame. Trickbind is a terrific sideboard and I have wondered why it was half the price of Shadow of Doubt. It is marginally more splashable and has Split Second at the expense of a cantrip. It is also the closest thing to Stifle we have in Modern. The right deck for it to hate on has not quite surfaced but now is a pretty good time to grab a few. The lowest vendor price is $3.50 and buylists have already climbed to $3.25. Admonition Angel is a mythic rare from Worldwake. That set was only opened in very limited quantities for a short period of time. The third set in the block was Rise of the Eldrazi which was a large set. If you are opening up a Worldwake pack and pull a mythic we all know that everything looks like a consolation prize compared to Jace, the Mind Sculptor. It is still an angel that provides a form of removal or a roundabout flicker effect. It has casual appeal written all over it. It is also on the list of cards with a negative spread. The lowest vendor is selling it for $3.00 and the highest buylists are offering $3.50 so you can turn these into a little cash as well. I cannot find any competitive decks that are running Enchanted Evening but I can guarantee you casual Johnnies are working to break it. It can be an interesting fit for Prison or Enchantress decks and has amazing synergies with constellation cards. The increase in demand has pushed buylists to $3.50 while copies can still be found for $3.28. Just a few weeks ago I could find painlands alongside bulk nonbasic lands for a quarter a piece. Those days are over for now. This is their fourth printing so I doubt we will see them hitting $10 but everyone who plays standard will need their playsets of the appropriate colors. The scrylands a slow but offer a free scry so I expect to see them continued to be used in midrange and more controlling decks. Painlands will be used by aggressive and combo decks who do not mind sacrificing a few points of life to win a turn earlier. If the rumors are true that Khans of Tarkir will be a wedge block then we could see Llanowar Wastes played in Junk and BUG builds. Those are usually slower decks that will grind and opponent over the course of the game. I would suggest trading these for other enemy painlands. Yavimaya Coast is only slightly better off than Llanowar Wastes. It would be useful for BUG or RUG decks. It can also be used in Bant hexproof decks. I expect this to have a more stable price over the course of the next year. It even sees some limited play in Modern Bant Pillow Fort which is a deck almost as funny as its name implies. Trade your Llanowar Wastes for Yavimaya Coasts if you have the chance. It at least comes in the colors of degenerate things like Prophet of Kruphix. Mill has long been popular strategy with casual players in every format conceivable. Mesmeric Orb looks innocuous but for the low investment of a couple mana lets you mill you opponents for doing sill things like tapping lands for mana or tapping their creatures to attack you or use abilities. This is even one of the few milling strategies that translates well to multiplayer. This is another card that has a narrow margin between vendors buying and selling the card. You can get them for $1.75 and sell them for $1.50. I would just buy a play set and sit on them. The power of mill has caused slow and steady growth in a number of cards. I would feel comfortable sitting on these for a while with a minimal investment. In Standard, Modern or Legacy your burn decks want to play with a full four copies of Eidolon in the main deck. The ability to attack as a 2/2 for two mana and get in a free shock if they use removal spell has made this card a staple. Modern and Legacy are defined by their powerful two and three mana cards. This led to a first place finish in the SCG Legacy Open last week and a 9th place finish this week when everyone came prepared. I do not normally advocate picking up cards that are already on the rise but this is one you will want to hold onto. Journey into Nyx was also drafted less than a normal third set would be with Conspiracy nipping on its heels only weeks after release. Burn decks are on fire and every Modern burn deck runs Flames of the Blood Hand either in the main deck or in the sideboard. It helps overcome speed bumps like Kitchen Finks or painful interactions with Archangel of Thune. This is a card I have found in plenty of bulk boxes so you can still find them relatively easily. They are buylisting at $0.89 and you can purchase them for as low as $0.70. If you want to double up on the life hating fun you can find Skullcrack for as low as $0.25 and sell them for as much as $0.50. Of all the enemy painlands I am most excited about Battlefield Forge. Boros Burn has already has a presence in Standard and Modern. This card is well positioned to help power out that early burn and Boros burn spells like Lightning Helix and Warleader’s Helix help recover the life without missing a beat. I expect this to be the fastest growing painland this fall. Ajani has had a busy year. He started out Calling the Pride got into Mentoring Heroes and is now incredibly Steadfast. Caller of Pride is powerful as a three mana planeswalker but it has been printed twice and is now getting ready to rotate. It has not seen any adoption into Modern so its price is just getting ready to take a big hit. You can still sell them for up to $4.51 which is fantastic considering the lowest vendor is selling them for $4.75. I would unload them while I could. Shadowborn Demon has seen some play recently in BG and Junk Standard decks but no one uses him in Modern. Casual decks have many more tempting demons to play with. It will be going down to $2 to $3 sooner rather than later. I would get out. The only thing that will save it from being bulk is the fact that it is a mythic rare demon. From Melira Pod to Kiki Pod and almost every Pod variant in between Chord of Calling does some heavy lifting. It provides redundancy and helps keep toolbox decklists consistent. The announcement that it was being reprinted in M15 caused a great stir in price. This is great as a financier. It has huge appear to Timmies and Spikes alike. Some places are dropping the price more than others. We can profit from the discrepancies. You can buy these as low as $19.99 which is great if you have been meaning to pick them up anyway. (or better yet a month ago) and buy replacement copies for a fraction of the cost in a month. Garruk Relentless is only played in Legacy Nic Fit but any planeswalker with five abilities should have a higher price tag than this. It is a double sided mythic rare planeswalker tied heavily into a storyline interaction that has already occurred. This makes it one of the toughest cards to reprint in Modern. I would grab some cheap copies before the price bounces back. Sorry, I think you might have a problem with your data accuracy. I can’t find anywhere that Garruk Relentless price is at $1.99 even on your own website. Make sure the price is correct before posting. I like the idea of having ranking everyweek but if the data are not accurate then it would be useless. Thanks. That is the unfortunate side effect of writing and submitting an article a few days before it gets posted. Someone had already acted on the low price. I hope some of the other information was helpful as well. Chain Veil will not be a thing. The card that couldn’t do anything with itself alone is bad. (unless the effect is super strong but this card is not that level) I could see it go down to around $2 or so. I wonder if Chandra, the Firebrand is going up because of the M15 The Chain Veil. Usually when I see her, people have mill spells in their decks they want to copy. The chain cell is a very interesting artifact. I can see it being popular in casual decks for years to come. It has strong synergy with every planeswalker ever. The big question is how it will be used in competitive super friends decks in modern and standard. For Chandra, if you take the price of Amazon out from the calculation, it seems that there is no jump of her price at all. IMHO, I think you need to redefine what price you want to compare and put into your ranking. Otherwise, it could not reflect on any points.